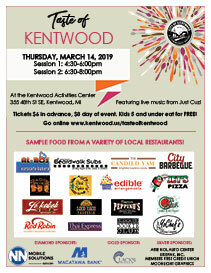 Join us for the 18th annual Taste of Kentwood. Sample food from sixteen restaurants. We'll have live music from Just Cuz. You won't want to miss this evening of food and fun at the Kentwood Activities Center! Two sessions: 4:30-6:00pm and 6:30-8:00pm. Tickets: $6 in advance, $8 day of event. Kids 5 and under are free.